Australia’s newest and biggest cargo ship was named as Tasmanian Achiever II at a special ceremony in Burnie Sunday (Feb17). Tasmanian Achiever II is the largest general cargo ship to fly the Australian flag and is set to enter service on 1 March, carrying goods between the Port of Melbourne and the Tasmanian Port of Burnie. 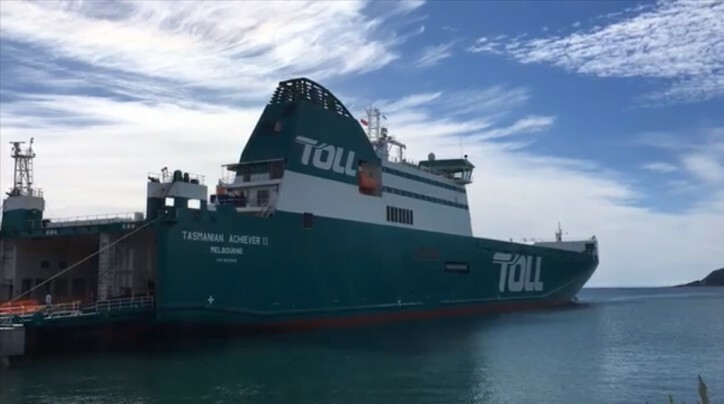 The 210-metre vessel is the first of two new ships commissioned by Toll to carry freight between the Australian mainland and Tasmania, increasing Toll’s Bass Strait cargo capacity by more than 40 per cent on each voyage. This increased capacity will ensure Tasmania’s primary producers and manufacturers have more reliable and guaranteed access to mainland and international markets on a daily basis said Steve Borg, Toll’s Executive General Manager, Tasmania and Shipping. “As the country’s largest private investment in coastal trading in 25 years, this is a major milestone for Australian shipping with Tasmanian Achiever II providing capacity to meet anticipated demand for the next two decades,” said Mr Borg. While providing greater capacity and increased efficiency, the ship will produce less emissions. Built to comply with strict standards on sulphur emissions, due to be introduced next year by the International Marine Organisation (IMO2020), the Tasmanian Achiever II has sophisticated on-board scrubbers that filter emissions. “The Australian economy, and in particular Tasmania, will be the real winner with greater certainty around the timely transport of goods, providing an opportunity for producers and manufacturers to increase output and provide more jobs,” said Mr Borg. The Tasmanian Premier Will Hodgman spoke at the naming ceremony, thanking Toll for their $311 million investment in improving the Bass Strait trade link, including $35 million to upgrade wharf facilities at the Port of Burnie, which will provide a big boost to the nation’s economy. L-R: The Hon. Will Hodgman, Premier of Tasmania; John Mullen, Toll Group Chairman; Hayley Burr, Tasmania Achiever II Junior Sponsor; and Taneki Ono, Japan Post First Executive Officer. “Toll Group is a major employer in Tasmania, and are a vital link in the supply chain, which ensures that not only our world-class produce can reach our expanding markets both domestically and internationally but Tasmanian businesses and communities have a reliable link for inward goods,” Premier Hodgman said. “We appreciate the ongoing support of the local Burnie community, our customers and industry partners in the lead up to this milestone, which is set to encourage greater investment into Tasmania and create more jobs ensuring a vibrant future for the state,” said Mr Borg. In port, the new ships will connect to the local power grid, eliminating the need to generate power from its diesel engines. A new wharf management system and customer booking software will improve terminal operational procedures to minimise traffic congestion and enable better freight tracking and monitoring of refrigerated cargo. Tasmanian Achiever II will replace Tasmanian Achiever I when the 20-year-old ship is retired from the route it has plied successfully for the last two decades. The new ship will make the 396 km Bass Strait crossing between Melbourne and Burnie in 13 hours, an hour faster than its predecessor and has capacity to carry 40 per cent more cargo, both in trucks or in containers. The time saved will be used in port to enable the simultaneous loading and unloading of additional cargo. Toll’s Steve Borg said the group was delighted to see the new ship and the improvements at Burnie delivered on schedule and was looking forward to the first commercial voyage on 1 March.